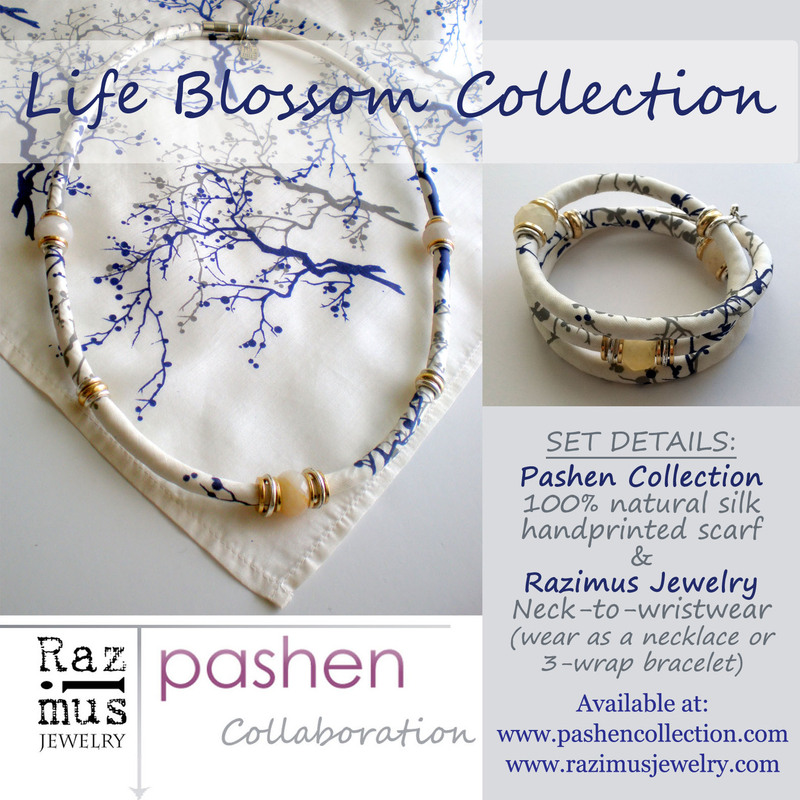 It’s been way too long since I’ve given an update, but life happenings have made it a challenge to keep up with the Pashen Collection blog. There are a lot of new updates, so I wanted to carve out some time to offer a few of those up. I have participated in a number of trunk shows at Social House in Lake Worth. They call them “Makers Meets,” as their goal is to bring together local makers and give us an opportunity (a platform – if you will) to share our talents, stories and goods with other participating vendors/artists, as well as those who simply attend the events to mingle and/or shop. The team at Social House is AH-mazing and the events have been wonderful for Pashen… I have met a number of other local artists and we have talked about collaborating on future projects. 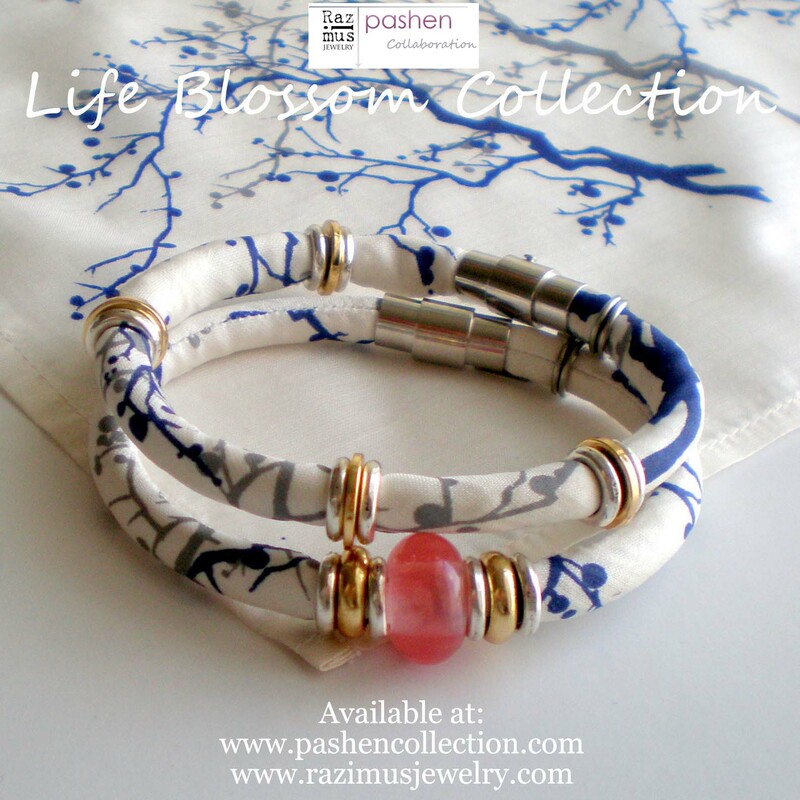 I have also been invited to sell the Pashen line in a number of local shops. One of the shops where pieces of the Pashen line are now offered as a result of one of these meetings/invitations, is Elizabeth Ave Station. Elizabeth Ave Station is located in the new Arts Warehouse District in West Palm Beach. 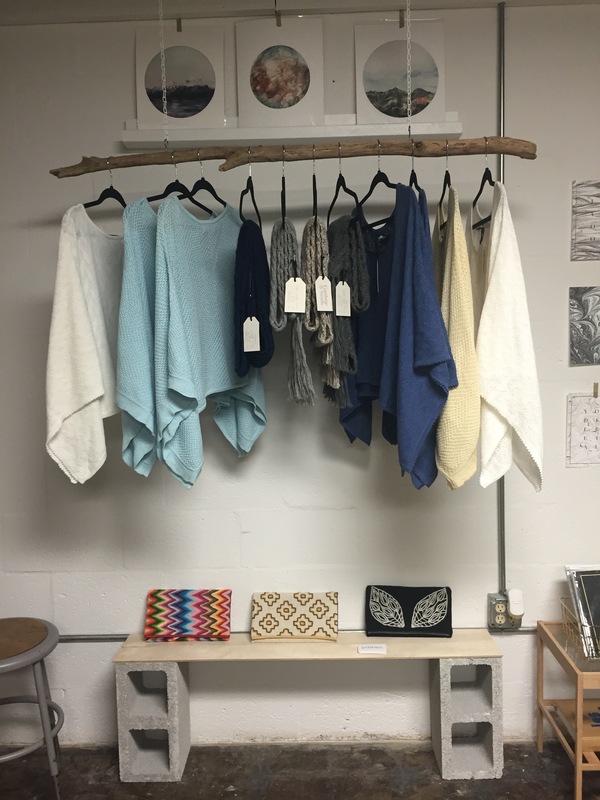 Prior to their opening, Dani from Elizabeth Ave was perusing the Pashen line at a Makers Meet, told me all about their plans to open and plans for expansion, and asked me to consider having the Pashen line offered in their soon-to-open shop. Her excitement was palpable and contagious (and still is) and I am so thankful for the opportunity to be part of the project. Three other shops where items from the Pashen line can be found are Bead & Reel, Good Cloth and Ethica. The styles vary from shop to shop, and we still have our shop on our own site as well. Next up – new styles are in the works, though these things take time. Sketches are drawn, materials are being sourced and I will do my best to post more updates soon. My primary goals with the Pashen line remain the same. – to offer beautiful, high-quality clothing and accessories, that have been ethically-produced with ethical materials and practices. My vision is clearer than ever and I will continue to support the ethical fashion industry and other environmental initiatives in any and every capacity that I can. 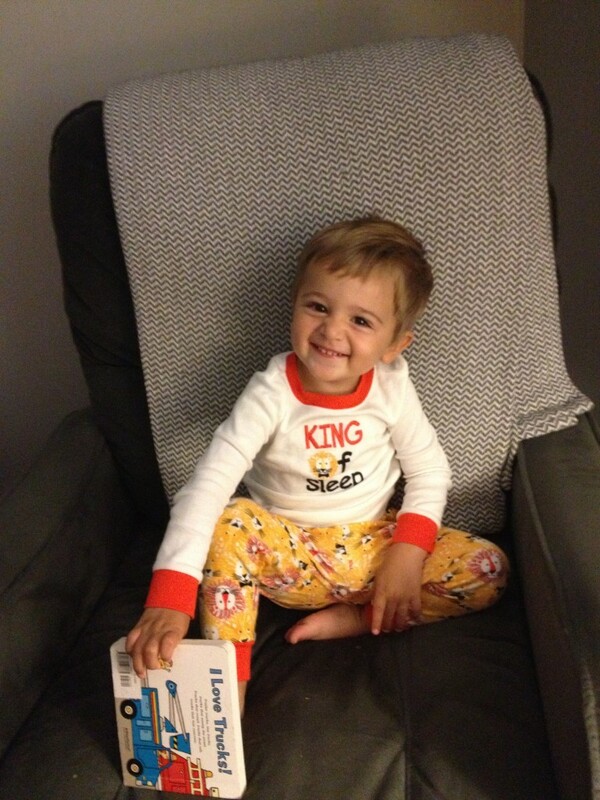 Thank you for taking the time to read my update and please check back soon! Waking up every day to see and feel LIFE, living near the salty sea, my beautiful family and the most loyal and caring friends any one could ask for, work that I love and believe in with all of my heart, my health, the food that I eat, my spirituality, a heart full of love and the desire to share it, and my greatest blessing – our son, Avel. Remember this Thanksgiving to count your blessings and be filled with gratitude. reflect on the beauty and fragility of freedom itself. A few months back we were recruited as a Brand Sponsor for the Fashion Revolution Day USA campaign by longtime colleague and friend, Oceana Lott, who is US Director for the campaign. Fashion Revolution Day is a movement to increase awareness of the true cost of fashion which will be held each year on April 24th, the anniversary of the Rana Plaza devastation. We want to create a fashion industry that values people, the environment, creativity and profit in equal measure. The mission of the campaign is to create a movement engaging consumers, environmental leaders, fashionistas, human rights activists and designers to think differently about who makes their clothes in order to make that happen. 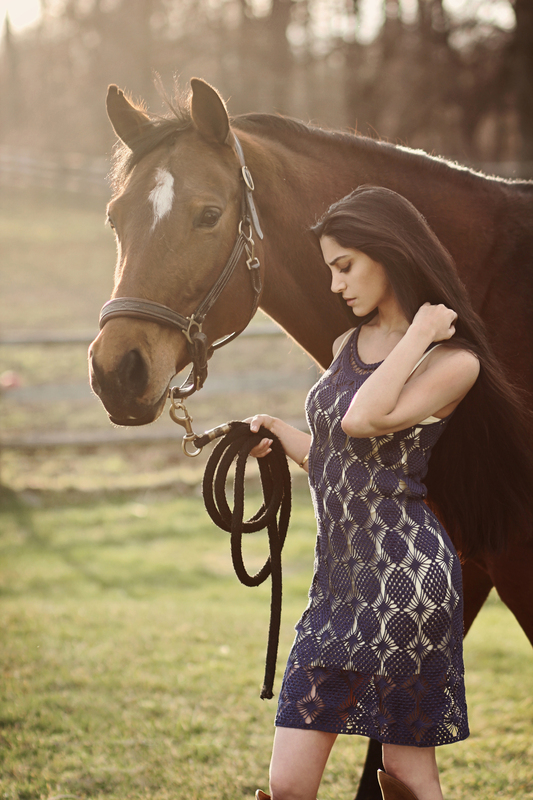 In support of the campaign, Gabby Wild, Model and Wildlife Conservationist, wore Pashen Collection’s Open Diamond Stitch Crochet Dress #insideout for a photoshoot. This dress was made by hand by one artisan who works from her home so she can be there to properly care for her family. 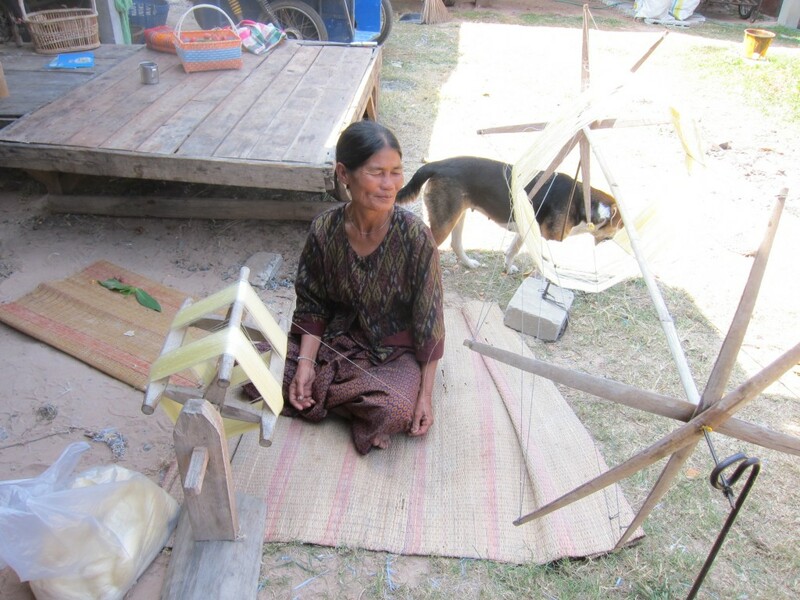 She earns a fair wage to help support her family and LOVES her job. 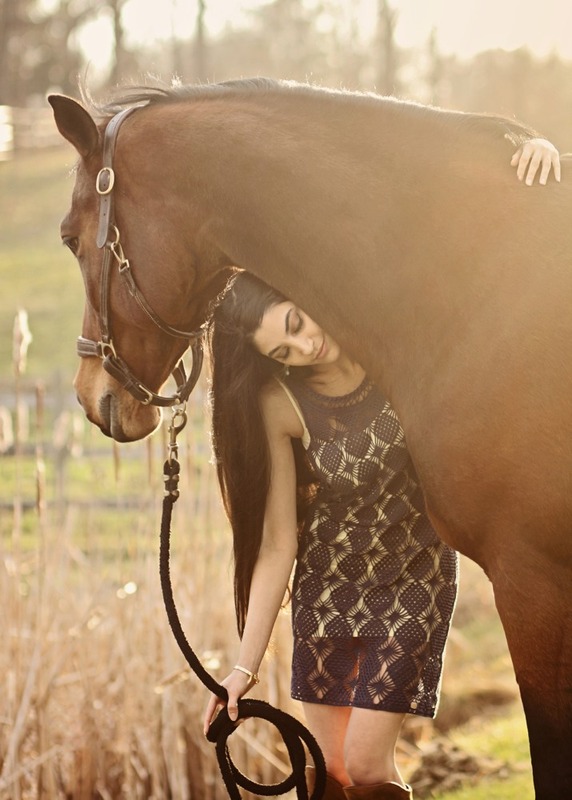 The stunning images, which resulted from the photoshoot with Gabby, perfectly portray our aim as a company to find harmony between fashion and nature. A special thank you to Oceana Lott for arranging this and for all her work as US Director for the Fashion Revolution Day campaign! We feel blessed to be collaborating for such a worthy cause. Water has a lot more to do with fashion than just bikinis and doing laundry. It takes 2900 gallons of water to grow enough cotton for one pair of jeans! 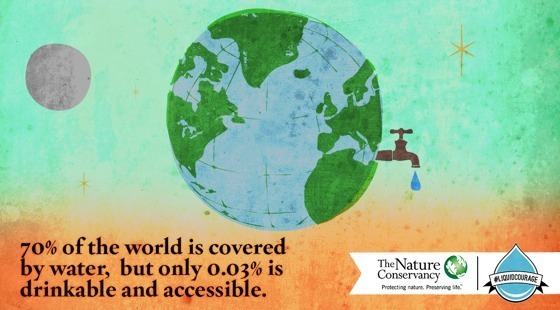 So, here’s a good question: water covers 70% of our planet but how much of that water is drinkable and accessible? The answer is .03%. Not 3%…not .3%… but .03% – pretty unsettling, I would say! By some estimates that leaves nearly 2 billion people without access to clean drinking water and many scientists believe that by 2040 we may need to find 40% more water. Think about how hard your life would be if you could not just turn on the tap and let it flow. There are serious water challenges throughout our world. Though shorter showers help, we are all going to need a little Liquid Courage to develop large-scale solutions. If you think there is nothing you can do, guess again. The Nature Conservancy needs your help to spread the word about this growing crisis by visiting their new Liquid Courage website learning about their mission and the Liquid Courage campaign and discussing it with every one you know. The aim of the campaign is to catalyze a conversation about water across digital platforms (Facebook, Twitter, Media, Blogs) and get the conversation (and the water) flowing. Find out where your local water comes from and start guarding that precious supply of water with the power of your actions and voices. 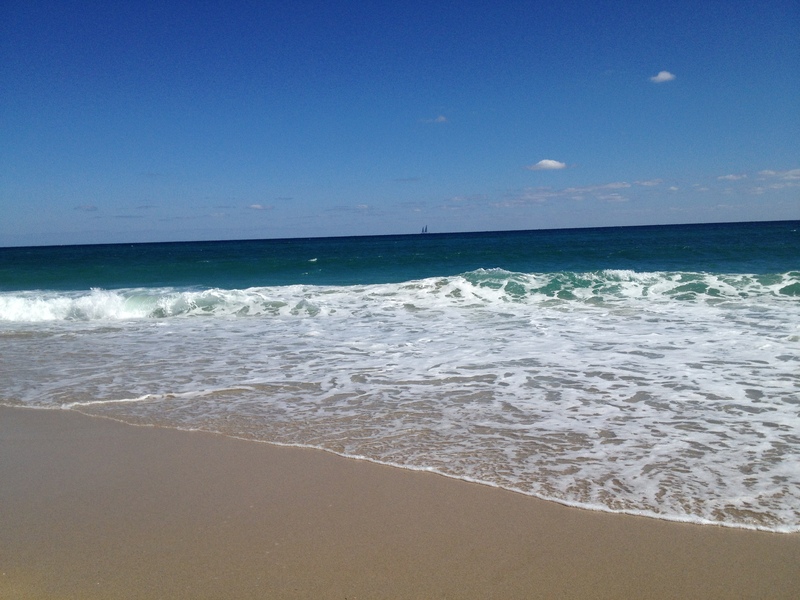 Check out what Adam Freed, Giullio Boccaletti and Emily Simmons of The Nature Conservancy’s Global Freshwater Team are saying on Twitter - @AdamMFreed, @G_Boccaletti and @Eco_Em. For over 60 years, The Nature Conservancy has been working around the world to conserve the lands and waters on which all life depends. The Nature Conservancy has more than 400 freshwater experts working on protecting water at its source. In Patagonia, they are working with Patagonia Inc. to help local farmers protect grasslands from desertification by properly managing streams. They have also partnered with MillerCoors to brainstorm methods to be more efficient with water used in beer brewing. Today is World Water Day.. 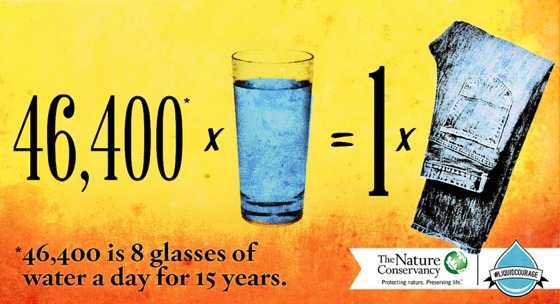 Celebrate by going to http://water.nature.org to find your Liquid Courage and be part of the solution. Shouldn’t every human being have the right to an education? In my mind, the answer is clear and unshakeable but unfortunately, in many parts of the world there is debate about this and education is in fact withheld from millions, especially girls. *Almost half the world (over 3 billion people) lives on less than $2.50 a day. *At least 80% of humanity lives on less than $10 a day. *The GDP (Gross Domestic Product) of the 41 Heavily Indebted Poor Countries (567 million people) is less than the wealth of the world’s 7 richest people combined. *1 billion children live in poverty (1 in 2 children in the world). 640 million live without adequate shelter, 400 million have no access to safe water, 270 million have no access to health services. 10.6 million died in 2003 before they reached the age of 5 (or roughly 29,000 children per day). *Less than one per cent of what the world spent every year on weapons was needed to put every child into school by the year 2000 and yet it didn’t happen. *Nearly a billion people entered the 21st century unable to read a book or sign their names. *Based on enrollment data, about 72 million children of primary school age in the developing world were not in school in 2005; 57 per cent of them were girls. And these are regarded as optimistic numbers. 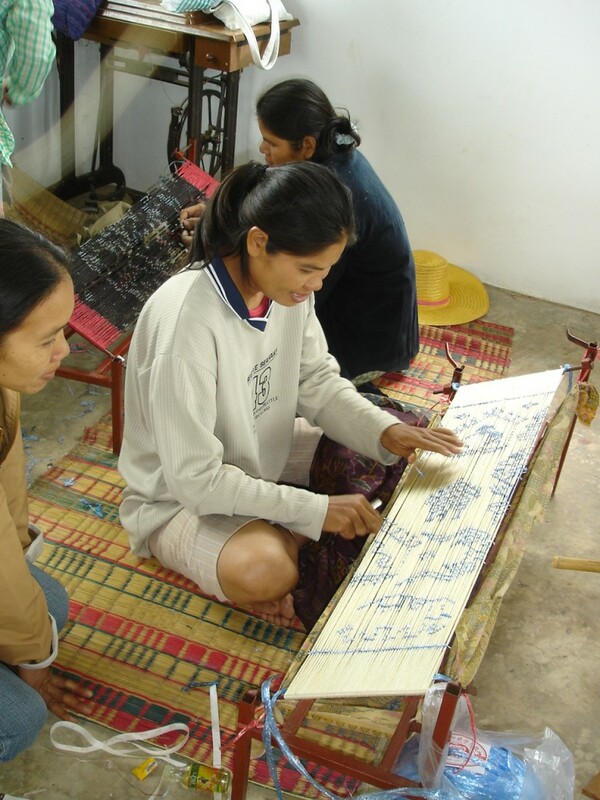 Studies show that providing education for young women in the developing world is key in societal progress with a reduction in fertility rates, a decrease in infant and child mortality rates, protection against diseases, more women in the labor force, educated women encouraging their children to pursue an education, a decline in youth violence, a decline in domestic abuse and a decline in human trafficking. With results like that, why wouldn’t everyone in the world, who has the means to invest in any small way, invest in education? The green movement is about more than just using sustainable materials and developing innovative ways to live without damaging the environment. It is about creating a better world, especially for the large part of the global population who struggle daily to survive. Human rights to education, a fair working wage, fair treatment, safe living and working conditions, clean water, healthy meals, medical care – staple things necessary for a healthy life – these are the focus for Blog Action Day and every day. To stop tragedies like the shooting of Malala for speaking out in support of human rights to an education. To stop tragedies like the factory fires in Bangladesh. After all, we are all intrinsically connected, our lives and actions interwoven to create the fabric of all life. Alpacas, cousins to the llama, are beautiful, intelligent animals native to the Andean Mountain range of South America, particularly Peru, Bolivia, and Chile. 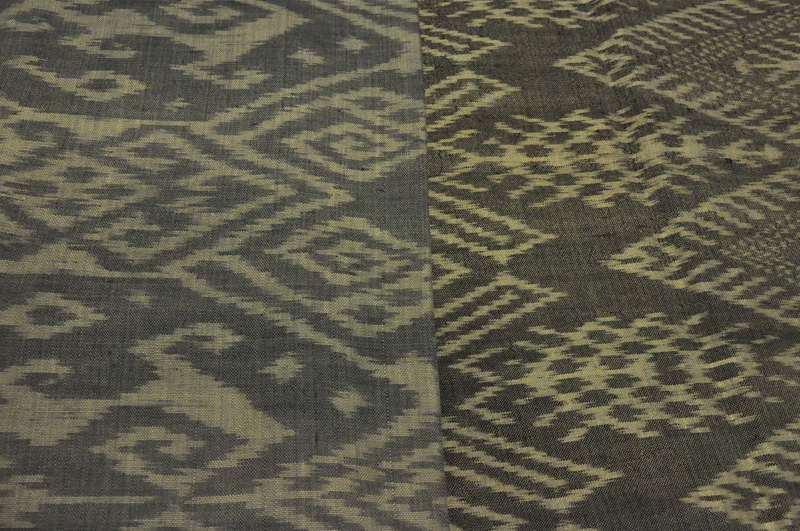 The alpacas, which provide the fiber for Pashen Collection styles, are from Peru. Adult alpacas grow to approximately 36 inches in height and generally weigh between 150 and 200 pounds. They do not have horns, hooves, claws or incisors. They are alert, curious and predictable. They are social animals that seek companionship and communicate most commonly by softly humming. Alpacas are shorn, without harm, every 12 to 18 months. They produce five to 10 pounds of luxurious fiber. Long ago, alpaca fiber was reserved for royalty. Today it is purchased in its raw fleece form by hand-spinners and fiber artists, and by knitters as yarn. 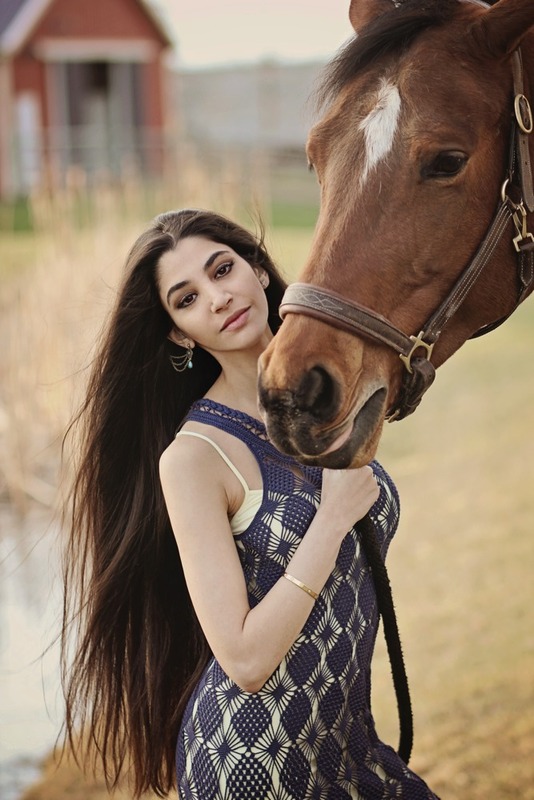 Alpaca fiber is very soft, have the luster of silk, and is warm yet lightweight. It comes in 22 natural colors, yet it can be dyed any desired shade. 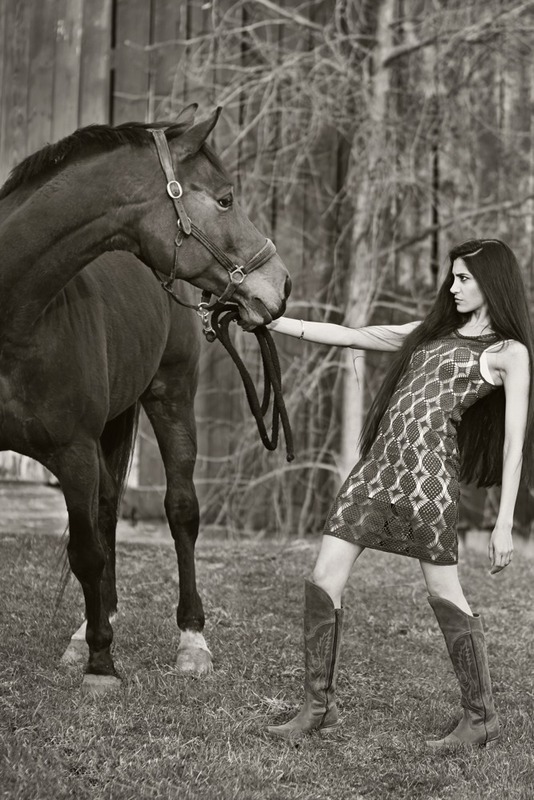 Containing no lanolin, alpaca fiber is also naturally hypoallergenic. Most people who are sensitive to wool derived from other sources find that they can wear alpaca without the itching or irritation they experience from wool because alpaca fiber is smooth. Other characteristics include: stretch, water repellency and odor reduction. For travelers, clothing made from alpaca is desirable because it is wrinkle-resistant. Sensitive to their environment in every respect, alpacas have soft padded feet instead of hooves and can leave even the most delicate terrain undamaged. Damage to topsoil decreases long-term soil fertility and in the process, the soil is eroded and weed invasion is encouraged. Alpacas prefer to eat tender grasses, which they do not pull up by the roots. Lacking upper teeth, they “cut” the grass with their bottom teeth and upper palate. This vegetation cutting encourages the plants’ growth. Because they are modified ruminants with a three-compartment stomach, they convert grass and hay to energy very efficiently and stop eating when they are full, further preserving the landscape on which they live. Alpacas also do not mind eating brush, fallen leaves and other “undesirable” vegetation. Alpacas’ pellet-like droppings are PH balanced and are an excellent, natural, slow-release, low-odor fertilizer. This rich fertilizer is perfect for growing fruits and vegetables. Because alpacas consolidate their feces in one or two communal spots in the pasture, it is easy to collect and compost, and the spread of parasites is controlled. While alpacas are environmentally friendly … and even beneficial… to the land, what makes them even more ‘green’ is the fiber they produce. No chemicals are employed either during feeding or during the industrial production of alpaca fleece into fiber. If dyeing is desired, only 20% of a normal dye quantity is required. All fiber from an alpaca can be used – even the fiber from the lower legs, belly, neck, etc is being used for things such as natural weed mats to be placed around trees. Alpaca fiber is biodegradable. 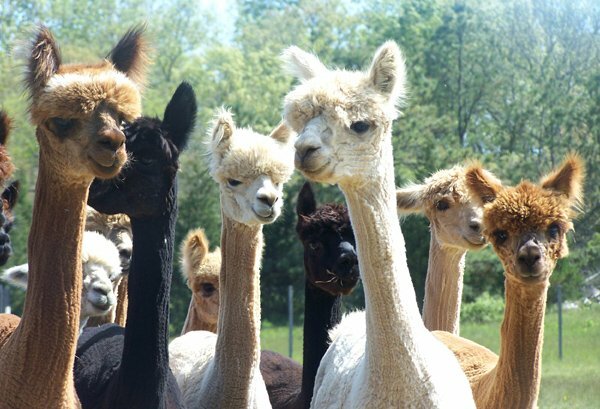 Alpacas require no insecticides, herbicides or fertilizers that pollute the groundwater. Whether it be tops, bottoms, knit accessories, or woven bags all of these wonderful attributes make alpaca a perfect fit for Pashen Collection! I love clutch bags. They aren’t the most practical (especially when I have my infant in-tow) because there is no handle or strap, but nonetheless, I just love the idea of a small bag and holding it under my arm against my side – it just feels ‘chic’. I went through my personal clutch bags and picked apart the favorite features of each. I then drew out the size of the clutch bag I wanted on a sketch pad. I traced this same shape out a few times then started drawing and coloring designs onto the basic shape. Through this, I came up with 3 clutch bags: 1 neutral combo with a geometric print, 1 bright and fun multicolor style with a repetitive allover zig zag pattern, and a third in black/white with an abstract emphasis on something that I really love – peacock feathers. 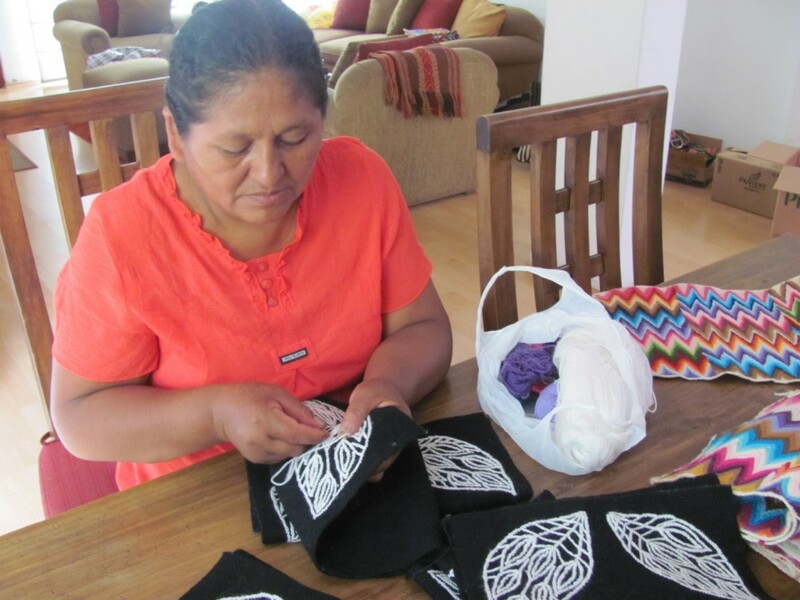 Next, I started pounding the ‘internet pavement’, contacting suppliers, manufacturers, artisan groups, and online wholesalers, until I came across a group in Peru that specializes in working with handbags on a small scale. They were excited to take on the project and sent me samples and images of past work. It seemed like a perfect fit. They created samples based on the specs I sent them, and with just a few minor tweaks to the designs after reviewing that first round of samples, voilà… the first 3 styles of Pashen Collection clutch bags were born. 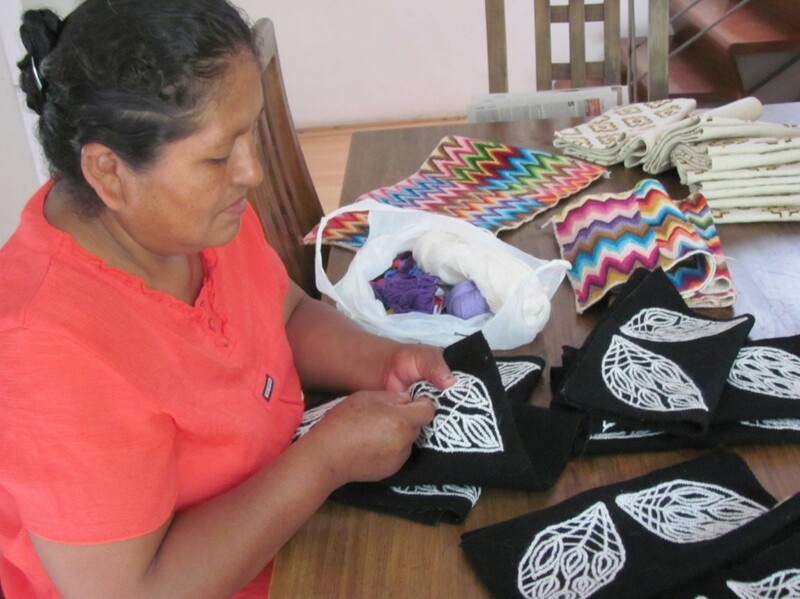 First the artisans make the design for the loom based on my specs, then embroider the loom, then they have to make the mold of each of the clutch bags and finally produce the bags. 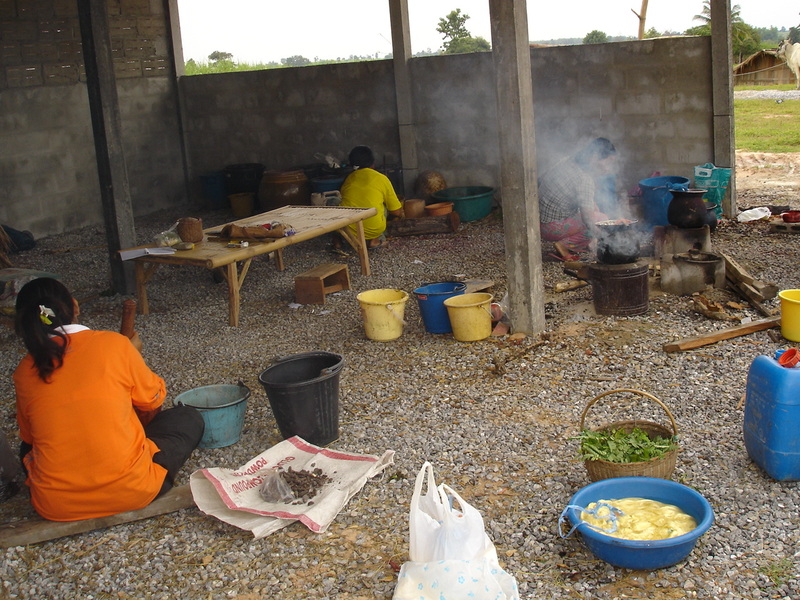 One artisan was assigned to each step of the project. The artisans who worked on the final hand-production of the clutch bags, worked from home, enabling them to be available to their families while still earning a living. 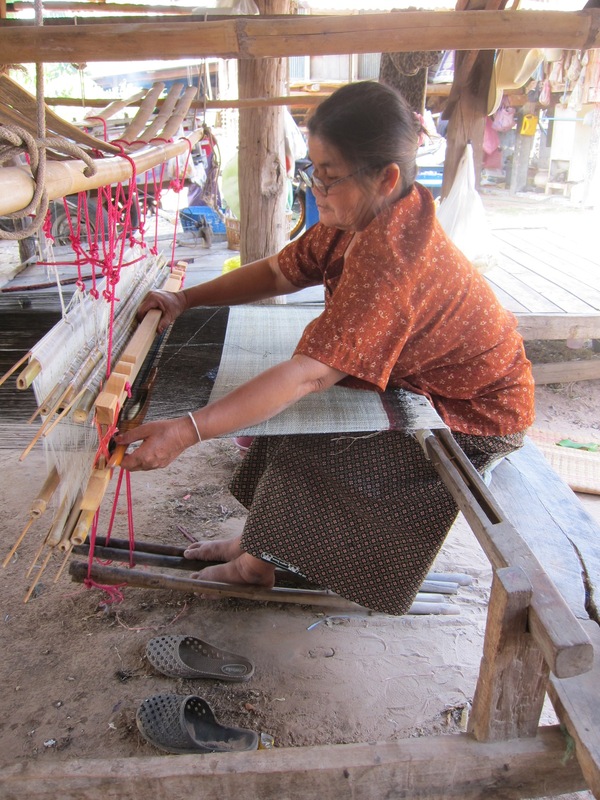 In my endless hours of research, I came across breath-taking images of silk scarves, looms, and a story about a group of artisans in a village of Isan (North East Thailand). This group of artisans work only with silk, only from local silkworms, the silk is organic – all the processes from mulberry tree to final rinse are chemical-free. They use only natural dyes – from plants and insects. In a nutshell, it is all organic, fair trade, culturally and environmentally sound, empowering to the artisans. The group of artisans is led by an American anthropologist with a heart of gold who is dedicated to helping them survive and beyond that, thrive, using dyeing and weaving skills native to where they live that have been passed down for many generations. Some of these techniques are in danger of extinction. I first emailed the anthropologist simply asking if they would be open to talking to me about doing custom work for a project I was working on. Little did I know, that from that first message I sent on October 6, 2011, would blossom a beautiful exchange of knowledge based on technique and history related to silk weaving and dyeing and many, many conversations about tradition and style and a true love for the art of working with silks in this region. I truly learned so much and am eternally grateful for the attention, dedication and professionalism I have experienced in working with this group to create the first group of Pashen Collection ikat silk scarves. With the anthropologist as our intermediary, acting as a director/manager on their behalf and translating back and forth, the artisans and I worked together and the result is a group of gorgeous silk scarves. 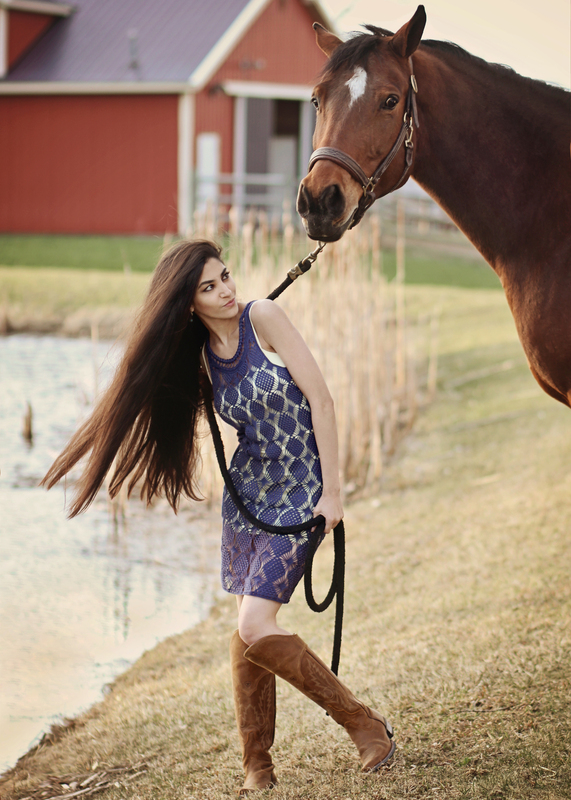 I wanted to work with natural dyes that would result in varying shades of blue and gold. The gold/bronze color was achieved by using jack fruit. 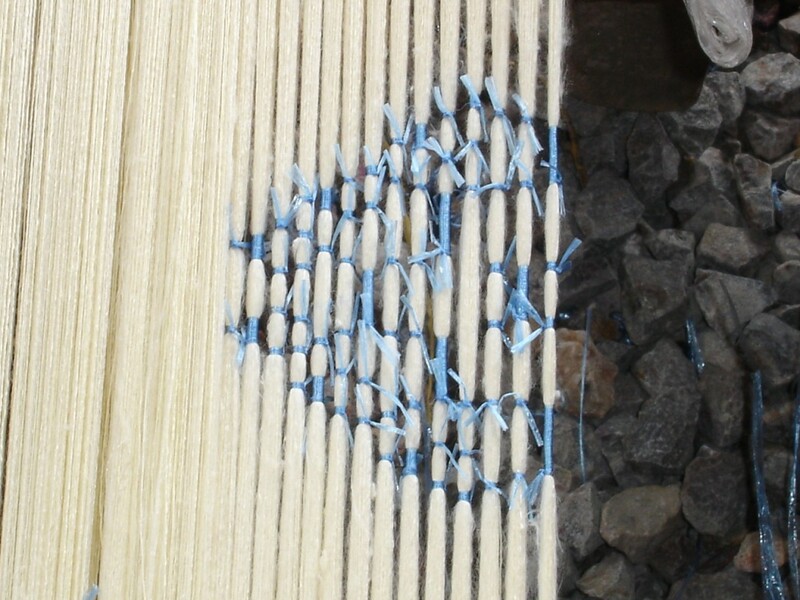 The blue and blue/grey shades were achieved by using indigo. The shapes I wanted to incorporate in the motifs were diamonds, hearts, arrows, and the naga serpent. I gave them direction but I also wanted them to add a bit of their own magic to each piece and they did just that. 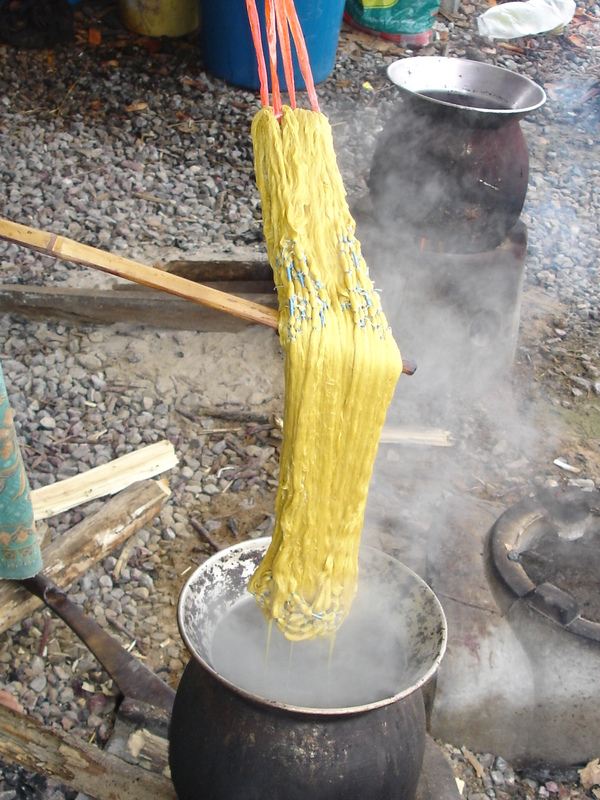 The dyeing technique for the gold/bronze silk scarves is ikat + float weave. 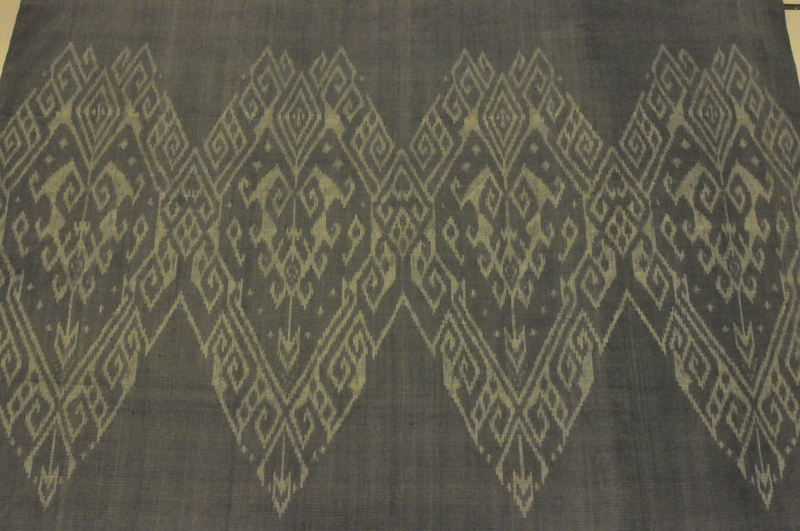 The dyeing technique for the indigo pieces is ikat. Some pieces are similar but because they are hand-dyed and crafted, no two pieces are exactly alike. 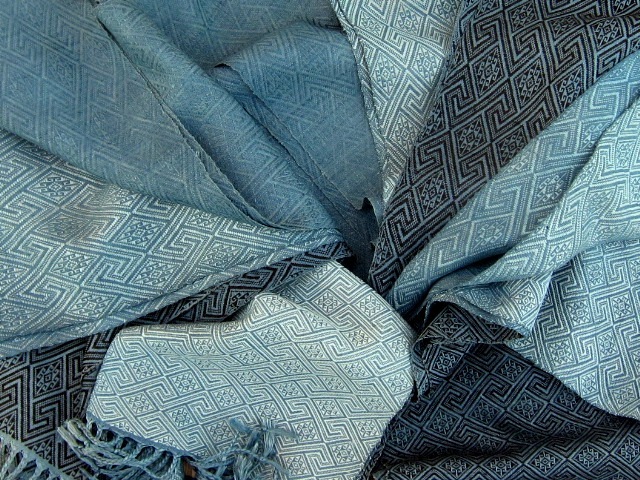 The indigo silk scarves measure approximately 36 x 36 inches and can be worn as head scarves, cowled around the neck, wrapped around the waist or even wrapped around the bust (like a crop top). 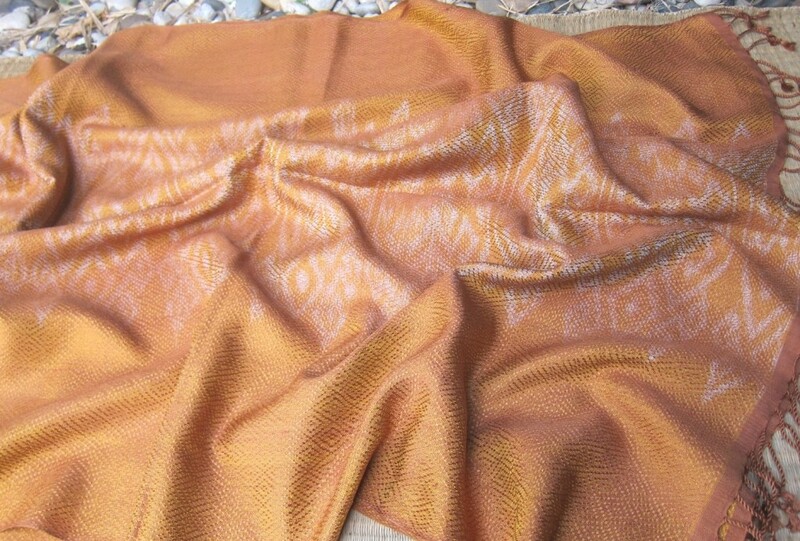 The gold/bronze scarves are approximately 80 x 30 inches and can be worn many different ways as well. 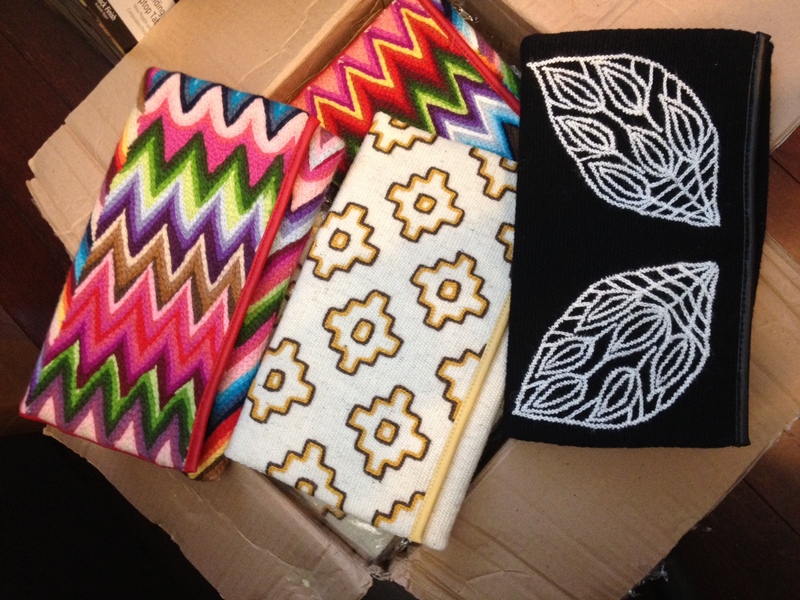 Each and every scarf is a very special, handcrafted piece of art. Sometimes I like to rummage through my old art school projects to reminisce about those days: endless projects, ball of nerves, all-nighters, new friends, and the things I learned about fashion, about business and about myself. 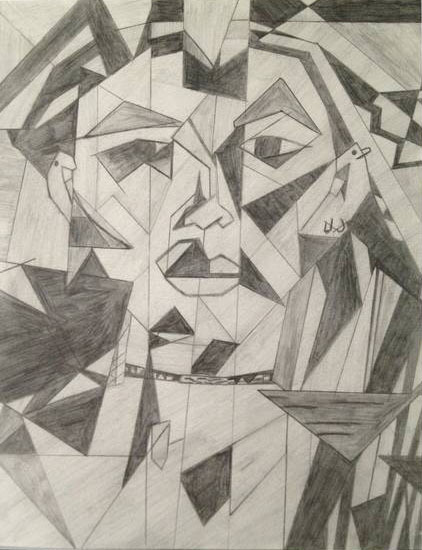 My very first in-class art school project on my very first day of art school consisted of selecting a favorite artist (I chose Picasso), selecting a visual art style used by this artist (I chose cubism), and picking up a pencil (pencil only) and drawing a self-portrait. The assignment was given in that order and we didn’t know we would be drawing a self portrait until we had given the teacher our selections of artist and style. © COPYRIGHT 2018 Pashen Collection. All rights reserved.